This is a post I should have made during the summer when Karsten got back from camp but other things kept popping up. Now we are about to host an Open House for the camp on February 8th so I thought I'd post some photos to here to share. If you are interested in learning more about French Woods in New York, let me know. We'd love to have more friends from Seattle attend with Karsten. The camp was three weeks. Yes, three weeks. It was a long time for Karsten to be gone but last night he asked if he could go for a LONGER time. I had heard about this camp on NPR a few years ago and then it turned up in a book I was reading. Karsten and I watched the two minute video on the French Woods website and he begged me to go after that. It took us a few years of thinking about it before we actually sent him, but by the time he hit 12 we knew we needed to do something big for him that he could feel proud that he did on his own. He loved it. He came back with a lot of new skills to show us. He made new friends -- boys and GIRLS. He feels comfortable in Photoshop and has tried putting some finishing touches on his Project Pond video game. I think he would live there if he could -- even with the camp's "No electronics" policy, which is a big one for him. The camp was huge and basically had everything, so here are just a few samples of what I saw on my visit. The cast of The Boys from Syracuse, a parody on Shakespeare's A Comedy of Errors. Note the orchestra that played live music for the play. Karsten had two different roles in the play. Here he is a tailor. Karsten with his DJ instructor. His favorite "major" was learning to mix music. Some of the DJ equipment. Karsten sampling some of his music for me. The posters on the wall made me laugh. 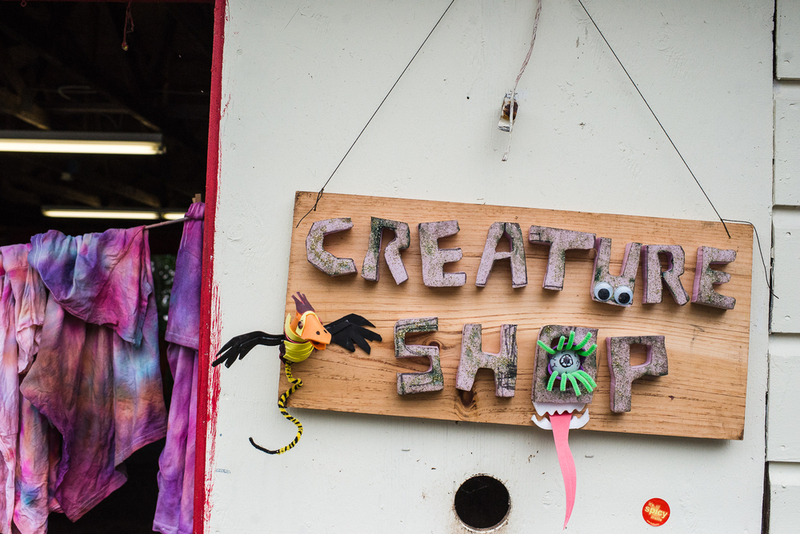 Not sure what the "creature shop" is but I liked the creative sign. Tie dyed shirts, of course. Karsten made friends with one of the horses. He wanted me to meet this guy. It was fun to meet some friends of Karsten's. He knew a lot of people. Karsten's cabin is the closest one in the photo. After the first week the kids can email home. They can call too but I never got a call. The camp said, "no news is good news." That was good to hear because I didn't hear much at all! Karsten's bunk. The sheets I sent didn't make it on the bed, I see. Karsten's dinner. He didn't go hungry, which is something I was worried about because he is the pickiest eater ever. Karsten's Project Pond video game. The object is to save the ducklings from the evil robotic geese. Karsten's video game creator instructor. He has a video game company in the UK. He also teaches at a university. Karsten's counselors. All of his counselors were from the UK or Australia. One of his friends he met was from Mexico City but her mom was living in Switzerland. Another friend he made was from Spain. This was definitely a good international experience for Karsten. After camp we made a quick visit to NYC. If he goes again next summer I would take him to NYC BEFORE camp, not after. He was ready to go home by the time I picked him up, not take another trip. He flew into Newark, NJ by himself and then I went and picked him up so I could see the "festival" at the end of camp. Taking the New York water taxi to the 911 memorial. A piece from one of the old towers that was saved from the wreckage. Visiting the memorial museum was worthwhile but emotional. The Shake Shack was a great spot to eat for us. Last time I was in NYC I think there was only one location but now I think there are quite a few. The meat packing district. How did I not visit this part of NYC before? I fell in love. The New Jersey 911 memorial. We visited Ellis Island and the Statue of Liberty. We found my grandma and great-grandparents in the records. They had visited Norway for six months when my grandma was a baby so that was fun to see.